The Novacat is a Clan Heavy Mech focused mainly on Energy Weapons, making it one of the few Mechs that rarely requires ammo. The Novacat is quite slow, but carries respectable Armor and devastating mid- to long-range Weapons, making it an excellent fire-support Mech. The massive heat generated by the full arsenal of Energy Weapons is efficiently dealt with by a gigantic array of Double Heat Sinks; most Novacat variants come equipped with sufficient DHS's, giving it some of the most incredible heat dissipation abilities of any unit. All but one Novacat variants also come equipped with Eoptics allowing them to spot and engage targets at long-range effectively. While more than capable of dealing with any Mech at nearly any range, the Novacat has a notable weakness: all its firepower is carried on its arms, meaning that a few well-aimed shots can rob the Novacat of its offensive power, rendering it a very expensive walking target. The Novacat Prime carries an impressive mixed array of long-range Energy Weapons. On its Right Arm are mounted 2 CERPPC's, and on the Left Arm are 3 CERLBL's, giving it fearsome long-range firepower. 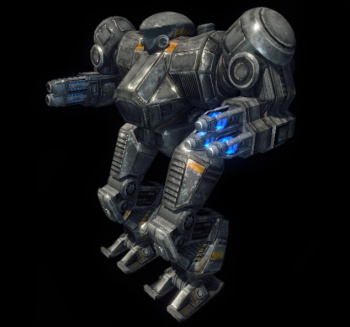 By carefully managing its rate of fire, the Prime Variant can output a non-stop barrage at any target in range, using the CERPPC's to disorient pilots and deal heavy damage while the CERLBL's dissect enemy units with pin-point accuracy. It should also be noted that when the 3 CERLBL's are fired as a group, even a glancing hit will kill enemy Battle Armors outright, making the Novacat Prime a deadly BA sniper. As all these weapons generate extreme amounts of heat, careful fire disciplined must be maintained despite the large amounts of Double Heat Sinks; Coolant should be used when appropriate to rapidly dissipate waste heat and minimize heat damage. The Novacat A's weaponry consists of 3 CERLBLs and one cGauss giving it extremely precise firepower put to 900 meters. When carefully Chainfired, the heat generated by all 3 Lasers can be managed by the Novacat A's DHSs. Alpha-striking without cooldowns will require frequent coolant flushes though. Coupled with the inherent accuracy of the Lasers and fast projectile speed of the gauss round, this allows the A variant to strip the limbs off of enemy Mechs in rapid order. It should be noted that when positioned properly, and when running in Passive Radar, the Novacat A can deal relatively stealthy damage, as the heads-up damage indicator for Lasers can be hard to notice in the thick of battle. Perhaps the most extraordinary Novacat variant, this configuration utilizes MASC to dart relatively quickly in and out of engagements against slower opponents while under the cover of GECM. The Novacat B cuts down on firepower and range by mounting only 3 Large Pulse Lasers. The Novacat B rarely has heat issues due to both the reduced heat generated by Large Pulse Lasers and the reduced number of total weapons; this makes the B variant much better for hot maps like Inferno and day-time maps like Extremity than other energy-heavy units. The Novacat B's preferred tactic is to keep its distance from enemies at all times and only closing in on already crippled enemies to bring its close range CDSSRM4 into play. At only 86500 C-Bills, this Novacat fills the role of the least expensive, long range and cool running variants well. Repeated alpha-strikes from the Novacat C are possible and synergize decently as both the overheat warning on the UAC5s and heat warning of the group fired ERLBLs are reached at roughly the same time. Pilots should keep the range open as the overall damage output is not as high as the other 'cats. A mix of pulse lasers lasers and heavy lasers with various ranges and recharge times can make this variant look at first glance a complete mess... until you get into it and realize the almost continual alpha-striking capability it has due to its 19 DHS! The damage output is staggering! Unfortunately, this variant requires quite a bit of face time, so a wise opponent will aim for its heavy laser right arm. 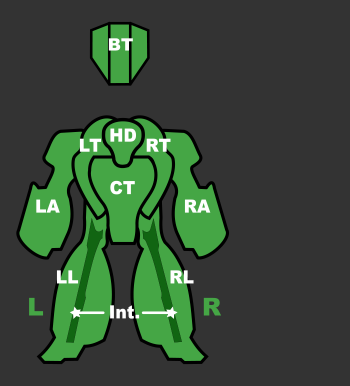 Protecting it with timed torso twists away from the enemy is key for victory on the battlefield. Similar to the B in both range and tactics, the Novacat E, nicknamed Running Mack Smash, is a long range twin ERPPC sniper which can quickly close the distance to its prey under the cover of GECM and unleash the devastating UAC20 blasts. Mechwarriors should watch their heat output as its 7 DHS are inadequate to keep the mech cool when using MASC and even chain-fired ERPPC shots. B-Pod helps with pesky Battle Armor that dare get too close. Figgis, is one of two Novacat variants to use long range missiles. Pilots should enable chain fire for both weapon groups and keep their prey at long range under constant barrage from its four LRM5s, while blasting them with its two ERPPCs. The screen shake caused by all of the F's weapons can easily throw off any long range sniper's shots. This variant is also quite cool-running as it has 13 DHS.B-Pod helps with Battle Armor ambushes. Another non-energy focused variant, the Novacat G still fulfills its roll as a cool running medium to long range skirmisher. Using twin cLBX10s and a single heavy large laser that reach out to 600m, this inexpensive variant will eat away at opponents armor more slowly than the other Novacats. The cLRM10 aids in long range harassment. Perhaps this variant is best used on hot maps where the others will struggle. Created after the battle of Tukayyid in 3052 by its namesake, Clan Nova Cat. It's based loosely on the Night Gyr, a Jade Falcon design. The basic components of the design along with the fact that it's an OmniMech gives it large amount of room for a large amount of heat sinks it uses in most variants. Clan Nova Cat is known for its sharpshooters, and this mech is no different. Built for long-range combat, the Primary variant fields exclusively long ranged energy weapons. This page was last edited on 29 January 2019, at 14:59.